Doesn’t it feel like the year just started? We can hardly believe the end of 2018 is near. What a great year it has been for our team here at Speak Creative. "Looking forward to coming to work everyday and help drive results for our team." "Grinding through projects as a team and refining our process to benefit the client experience." "Watching our team grow and tackle bigger projects with excellence! And the snacks." "Our team is the best. I am truly fond of my coworkers- they all work hard, they are kind people, and they make this company excellent at what it does." "The internal collaboration between directors, teammates and project teams." "The team dynamic and how much we all support, encourage, and uplift one another." "People, always the people. When you enjoy the people at work, motivation to succeed comes naturally." While it’s true that we come to work each day with the intention of producing client work, the way we work together has been a highlight of the year for many. We were honored to represent our state and help make the Tennessee State Museum’s website shine with the opening of their brand new museum. When a client comes to us with great ideas, it shows! Our friends with Peak Street Church brought creative, fun ideas to the table for a slim site that shared just the basics of getting people to their East Dallas church. Collaborating with the National Civil Rights Museum to capture this event was the highlight for a few of our staff. 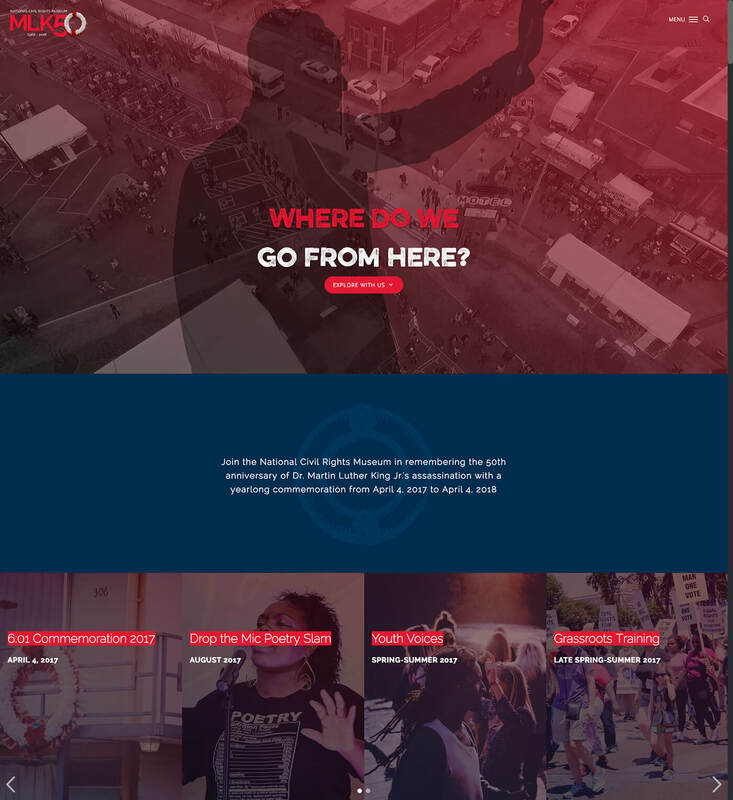 From planning for the year leading up to the 50th commemoration of Dr. Martin Luther King’s passing, evolving the site to tell the story of so many who have been inspired by Dr. King, and marking a truly momentous occasion with the NCRM team, it is both a site and a moment we will not soon forget. The cat people in the building mark this special site as one of their favorites, and it’s easy to see why! Partnering with the Humane Rescue Alliance in Washington, DC over the years has been a joy, and helping with their special initiatives like caring for the overpopulation of cats in their area shows that they exemplify what it means to work with heart. A Memphis staple making its way throughout the region and beyond, WISEACRE is a fan favorite of our team. Interactive design that matches their bold personality makes this a fun, out-of-the-box design that we had a great time creating. Kalamazoo’s Air Zoo was a joy to work with. With world-class photography and exhibits, the Aerospace & Science Experience offers hands-on learning for both children and adults and taking their web design to new heights was an all-team effort! Not to be overshadowed by client projects, we had a few major improvements this year to our own CMS that are a highlight for many of us. New forms, calendars, app frameworks and upgrade UI/UX all made the list of favorite Speak projects this year. Our Sitewrench custom CMS platform is more lightweight, easier-to-maneuver, and more user friendly than ever before. This website made a big splash with our team! Located in Norwalk, Connecticut, the team at Maritime Aquarium was great to work with, and designing around adorable pictures and video of their fish and mammal friends made this project sea-riously fun to work on. We would be remiss to not mention a few of the sites currently in production - but we can’t just yet! Our teams are still working hard to finish out the year strong, and we’ve got some BIG launches coming this month that we can’t wait to share. Our hope is that we’re always producing great things and that our next favorite site is just around the corner! Do you have a website project coming up in 2019? We’d love to help! To hear about more of our work, or to talk with a website design specialist, contact our team. We’ve worked hard to achieve goals throughout the year, and to celebrate that hard work, our team is taking time during the holidays to celebrate the season with our family. Our offices will be closed at 11:00a.m. on Friday, December 21 and will reopen at 7:00a.m. on Wednesday, January 2, 2019. If you have an issue that needs immediate attention, you may email 911@madebyspeak.com. 911 issues are those that require immediate and urgent attention. There is a $50 minimum charge for all 911 tickets submitted (excluding hosting service interruptions). All work related to 911 tickets is billed hourly (additional charges for after-hours work may apply). We’ve scheduled our annual Speak Week retreat for January 22-25, 2019. We will have limited access to email during this time as we turn inwardly to set goals for the year and spend time together as a team in Memphis. If you have further questions, feel free to chat us, or contact your Digital Marketing Strategist. « How Do You Optimize GMB in 2018?